Regular followers will already know that Anderson’s bar & Grill, located just off the bottom of St Paul’s Square on Mary Ann Street is one of our favourite venues in Brum. The sumptuous feel of the low brick vaulted ceilings and the ever warm welcome that await you downstairs behind the inconspicuous entrance always delight us. We think it’s the best steak house in Birmingham – a view that our friends and many staff at other venues have agreed with. Up until now they have not ventured into the ever increasing competition that is building for Sunday Roast lunch. Therefore, when we found out that was changing we had to try it out. They’re running only one sitting per month and apparently are booking up very quickly. We tried it in March for their first attempt. Greeted by the ever welcoming Simon we decided to have a quick drink in the bar area before lunch. There is a good choice of beers on draught to choose from as well as the normal large and varied wine list on offer. A bargain to be aware of for Sunday lunch dining, is the addition of either half or full carafes of house wine. We tried both the red & white and they were both ok. Not the best wines you’ve ever had but at a very reasonable price for a litre carafe they were certainly more than just quaffable and good for an unfussy roast lunch. The Sunday menu is a traditional roast (£12.95). 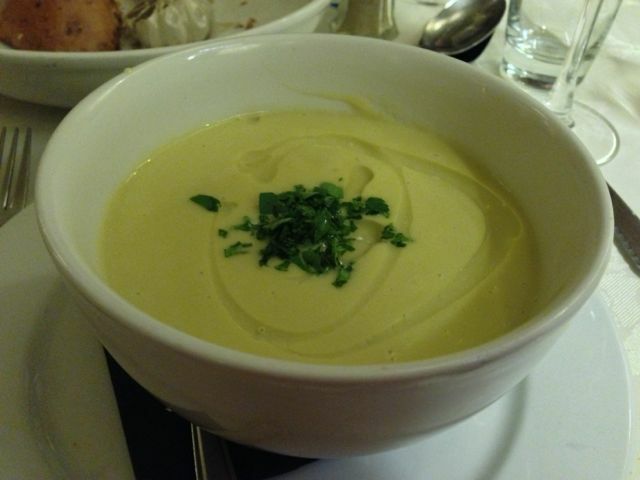 We tried the soup to start which was as amazing as usual, full of flavour and, if anything, a little too big as a starter especially when accompanied with warm breads and roasted garlic bulbs. We also tried the deep fried Camembert with a blueberry sauce – an unusual flavour combination that we thought worked well. When it comes to the roast itself, there was the choice of beef, pork or lamb as well as at least one choice of both fish & vegetarian dishes. Being in Anderson’s we obviously went for the beef and the lamb. The dishes are all served with very generous sharing bowls of vegetables. We had a selection of carrots, cauliflower and broccoli both in cheese sauce, parsnips, many more I’ve forgotten as well as the essential roast potatoes and Yorkshire puddings. But now to my gripe. If you’ve read many of our other reviews, you’ll know that we have a personal hatred for having our food served up on roofing products, chopping boards, bits of old driftwood and just about anything apart from a good old fashioned plate. 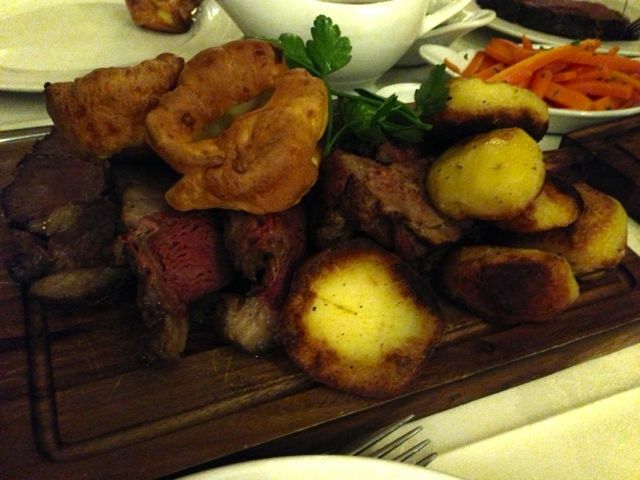 The meat, roast spuds and Yorkshires come out on a wooden board for you to share from. Whilst this is fine when you’re having a nice meal for two and both having the same meat, we had a issue with three of us sharing a board that contained both beef & lamb. In the low lighting it was not obvious which slice was what and my father-in-law for one, as a lamb hater, would of refused to eat beef contaminated by lamb. This serving method also failed when a large party seated behind us was all beef apart from two people at opposite ends of the table who had lamb. Queue the comedy routine as these two passed the board back and forth. Maybe I’ll start a petition to bring back serving food to me on crockery. Actually at least we had plates to eat off, it’s just served family style on the board, better than cutting fish and chips on a roof slate which I had at a restaurant that shall remain nameless. I mean, roof slate, really! Regardless of the tableware, the beef and lamb were predictably super. Succulent and tasty, served with delicious roast spuds to boot. The gravy was of particular, meaty, note. I suspect that the desserts will be as amazing as they normally are, but we were well beaten after just the two courses. At the time of writing, the dates for Sunday lunches for 2013 are: 3rd March, 7th April, 5th May, 2nd June, 7th July, 4th August, 1st September, 6th October, 3rd November & 1st December. You can check out our previous review of Anderson’s Bar & Grill here. 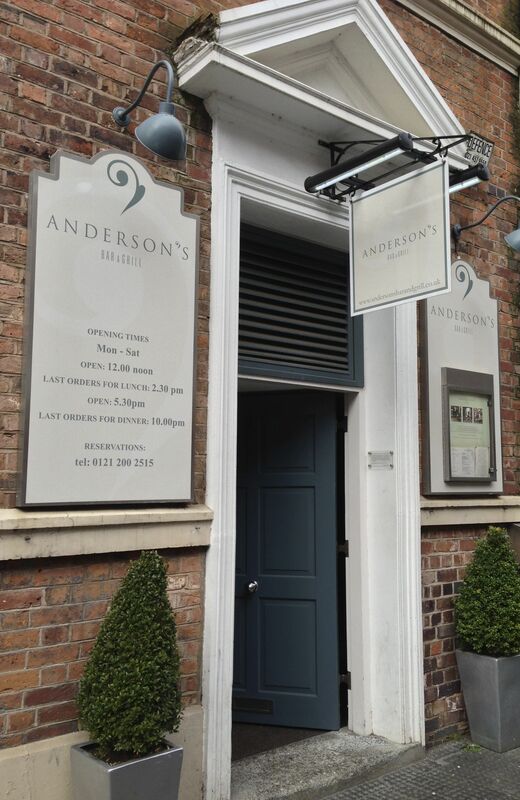 This entry was posted in Area: Jewellery Quarter, Area: Out of Birmingham, Cuisine: English, Cuisine: Steakhouse, My Favourite Places, Price: Average, Uncategorized, Venue type: Restaurant and tagged andersons birmingham, Birmingham Restaurant, birmingham restaurant review, birmingham review, birmingham steakhouse, birmingham sunday lunch, Out In Birmingham, out in brum, restaurant review, Where To Go In Birmingham. Bookmark the permalink.